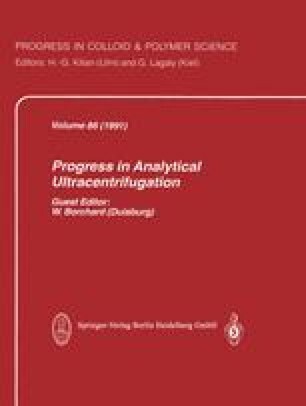 Different concentrated thermoreversible gelatin/water and k-carrageenan/water gels prepared from non-dialyzed polymer material are set into an ultracentrifugal field and investigated by means by equilibrium runs at 20°C. The refractive index gradient and the movement of the meniscus gel/solvent during the process of swelling and deswelling is observed with the Schlieren optical system. From the Schlieren patterns at the sedimentation-diffusion equilibrium the swelling pressure can be calculated by use of an approximation based on the mass balance. Soluble parts of the polymer which are not incorporated into the network even after long gelation times could be detected by means of the Schlieren patternsin both systems. For the system gelatin/water a superposition of a sedimentation-diffusion equilibrium of the soluble parts and of the swelling pressure equilibrium of the gel could be detected. In this case the swelling pressure equilibrium is clearly influenced by the presence of soluble parts. In the case of k-carraageenan/water a part of the sol associates outside the gel phase during the sedimentation and moves towards the gel surface.